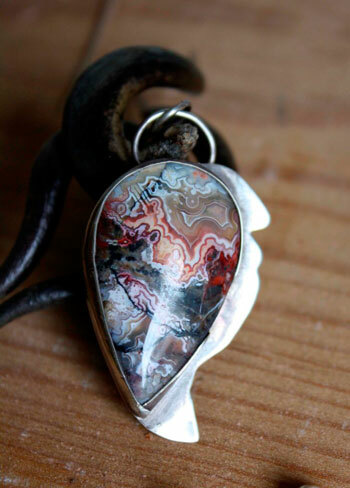 It is sometimes just called Mexican agate. You can also find the names of Rodeo Agate or Rosetta stone according to where they were mined. 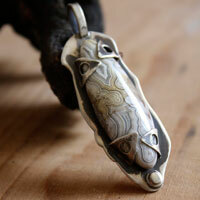 It can show very shiny colors, mixed with intricate waving laces. The colors go from white, to red, gray and yellow. The main source for Mexican crazy lace agates can be found next to Villa Ahumada, in the state of Chihuahua in Mexico. It can only be found in the layers dating back to the cretaceous period that is to say from 90 to 65 million years ago. This stone appeared first in 1895. But it is only in the 1950's that it was rediscovered by American geologists who were there due to the construction of a highway. It was used by the local Pre-Hispanic people as a sacrifice to soothe gods. One can easily imagine that this crazy line web showing red colors could remind of blood and of the blood system. This was really important in these cultures using sacrifices or autosacrifices to calm or to ask favors to the gods. It is considered as a tonic agate. 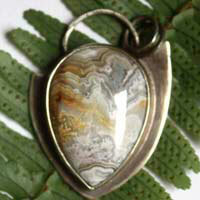 The crazy lace agate would be useful against allergies and would help to develop the immune system. It would help blood to circulate better in the feet and the legs. It would help expanding the walls of blood vessels and would then help avoiding varices. 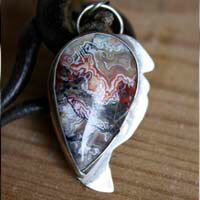 The crazy lace agate has also the same properties than the agate in general.